Whether further dates will be set is unknown. WE'RE BRINGING IT BACK AGAIN! 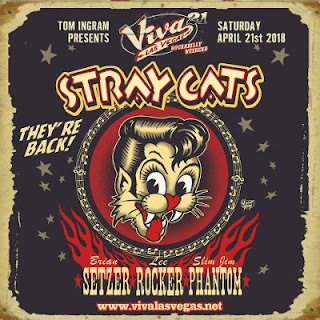 Stray Cats reunite for their first North American performance in 10 years on Saturday, April 21st part of Viva Las Vegas Rockabilly Weekend!! The Las Vegas Rockabilly Weekend runs from April 19 to 22 at The Orleans Hotel in Las Vegas. The Stray Cats are not the only veteran artists to participate during the weekend. Also on the bill at various events are Jerry Lee Lewis, Duane Eddy, Robert Gordon, Carl Mann, Narvel Felts, the Eldorados and many more. For more information and tickets, go to the Viva Las Vegas Rockabilly Weekend website.